Toddlers love being pulled along in a sled and maybe even sliding down some gentle slopes. But most sleds are only suitable for older children. There are baby sleds around, but what about the toddlers aged 18 months to 3 years? On this pages you'll find the best sleds for toddlers. There are choices for different price ranges. If you live somewhere where snow isn't guaranteed then a less expensive sled should be okay (though you may still want the photo opportunity from a traditional wooden sled!). If the sled it going to be a major form of transport in the winter then a more expensive sled will make sense. 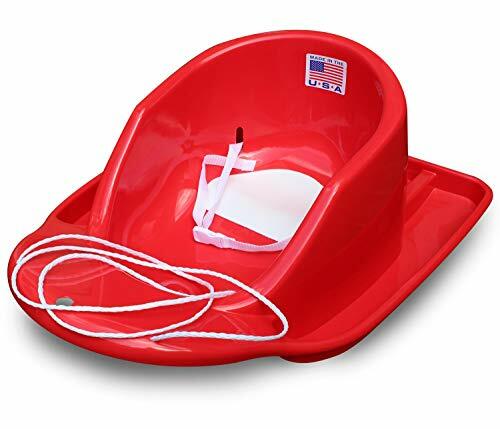 This Paricon Toddler Boggan Sled is an excellent budget choice for toddlers. The sled is suitable kids from 18 months to 4 years. The Toddler Boggan has high-sided design with deep sides and a tall back, plus a child safety strap to keep your kids secure. It also has a tow rope for pulling kids along - they'll like that! The Flexible Flyer Baby Sleigh is for kids aged 1 to 4. It's more a toddler sleigh that a baby sleigh! 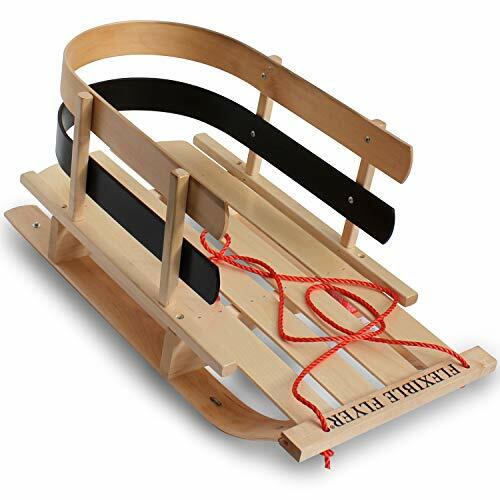 If you get snow regularly or prefer a traditional wooden design then it's worth getting a good quality toddler sled like this one. 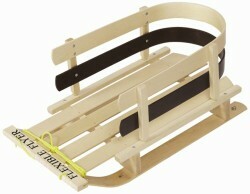 What I really like about this toddler sled is that it comes in a larger 2-kid version. Great for twin toddlers or siblings who are close in age. 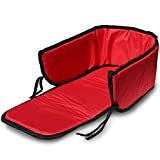 Both sizes of sled have red padded inserts available that will keep kids comfortable and a bit warmer. 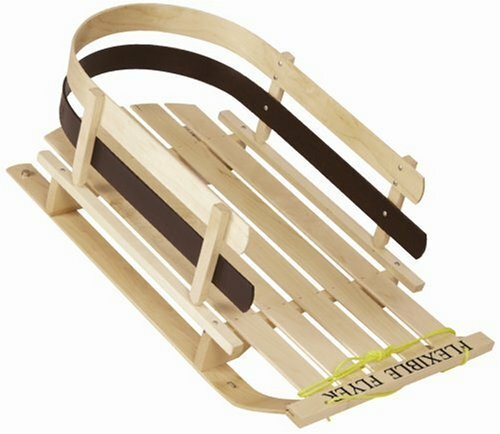 The Mountain Boy Sledworks Bambino Superior Pull Sled is a high quality luxury sled for younger kids. It's suitable for babies and infants from 8 months plus, toddlers and little kids up to age 6. There's enough room for two toddlers on here. 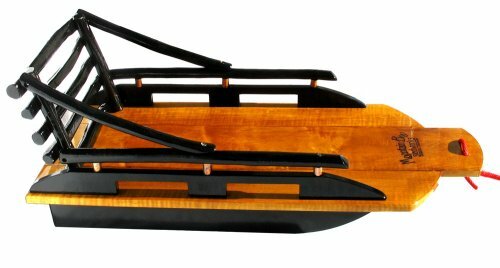 This is a gorgeous hand-crafted sled made from tiger-maple planks with black-stained willow hand rails. Buying a Toddler Sled for Christmas? Last year I bought my toddler a sled for Christmas. I decided that he would get it early if it snowed before Christmas, and it did! I was glad I'd bought it early because we were snowed in. We couldn't get out to local stores (who may not have had any sleds left anyway) and there was no way a delivery could get through to us. If it hadn't snowed before Christmas my plan was to set the sled up in our living room and put all his other gifts on top of it - mini Santa's sleigh style. Do you have any memories of toddlers with sleds? Brings back wonderful memories of when my kids were small. We spent many fun hours in the snow with a sled. This is a great layout of a page. Would you tell me how I am achieving this. Please write it very plain because I am not very good with comoputers.